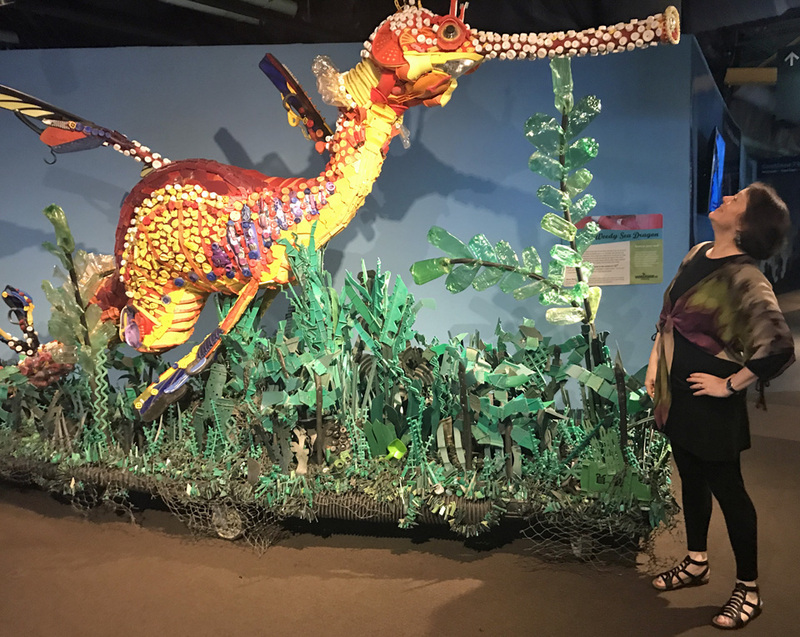 This month, the half-ton Steve the Weedy Sea Dragon and eight other creatures arrived aboard flatbed trailers to join a plastic menagerie that first arrived at the Audubon Aquarium of the Americas (where there are now 14 sculptures) and Audubon Zoo (two) in July. Like his brethren, Steve is fashioned completely from ocean debris – all the flotsam and jetsam discarded by careless humans that make up the endless plastic pollution bobbing in our waterways and littering our beaches. NEW ORLEANS (WVUE) – “Steve” the sea dragon on display at the Aquarium of the Americas sports a light from a boat, a pacifier and scuba flippers. All of the pieces and parts were recovered from beaches, and carefully crafted into sculptures. Artist Angela Hazeltine Pozzi and the organization she founded, Washed Ashore, have added nine new art pieces to the popular exhibit on display here since July. This September, a shark, a parrot fish, a sea lion pup, a jellyfish, and a giant anemone will occupy the U.S. State Department for a couple of days. That’s not because the nation’s foreign ministry is relaxing its security standards. 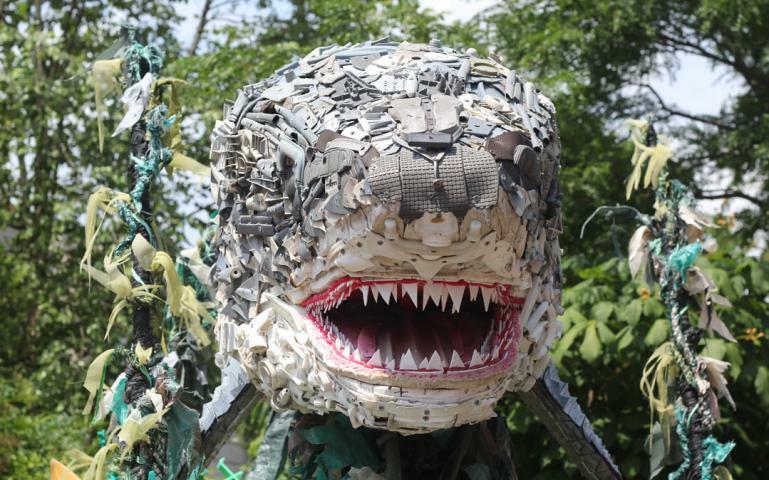 The animals are sculptures, which Oregon-based artist Angela Pozzi and her team of volunteers constructed completely out of plastic litter they retrieved from Oregon beaches. Standing beside her several-times-life-sized sculpture “Sebastian James the Puffin,” one of 17 of her works installed at the Smithsonian’s National Zoo, Angela Pozzi talked about the puffin’s namesake. She created the work the same year her father James died.”He’s very dignified like my dad,” Pozzi says of the puffin, who stands on a base of just the sort of entangled fishing gear that claims the lives of many ocean birds. The birds also often fatally mistake plastic trash for food, a label beside the sculpture notes. Great white sharks, killer whales, sea lions, even polar bears—the ocean is full of giant predators. But one of the ocean’s worst enemies is not part of the natural habitat or food pyramid: trash.